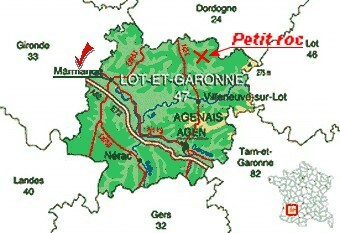 The " Lot et Garonne"
From the north . On the RN 21, 2,5 km after Cancon, turn left down a small road leading to "Petit-roc". There is a sign. From the South; On the RN21, 17 km after Villeneuve sur lot and 3 km after Castelnaud, turn right down.